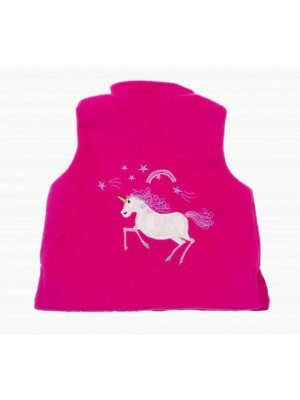 A great bodywarmer for a pony loving girl. 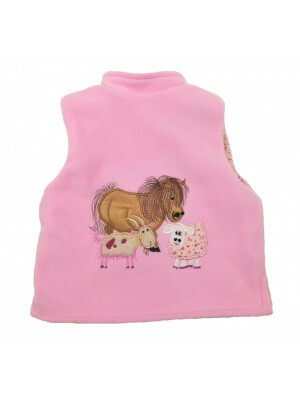 Completely reversible with a soft fleece on one side featuring a beautiful pony applique and a corduroy on the reverse. Popper openings down the front and pockets to both sides. 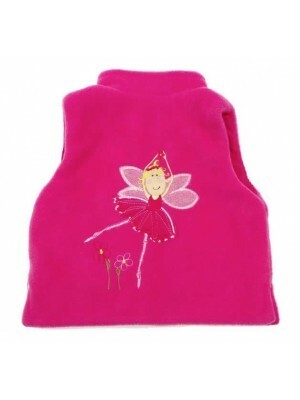 Fabric Co..
A cosy reversible bodywarmer with a pink fleece on one side and a fairy applique on the back and a pink cord on the other. Popper openings down the front with pockets featuring on both sides. Great to pop over any outfit. 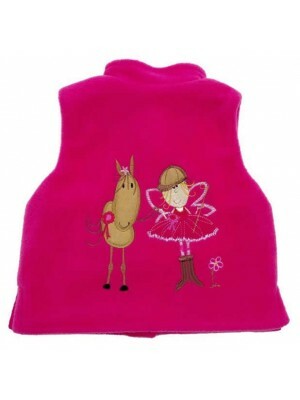 Fab..
A completely reversible cosy bodywarmer for those colder winter days. A pink cord on one side and a fleece on the reverse featuring a farmyard applique. Popper openings down the front and pockets on both sides. 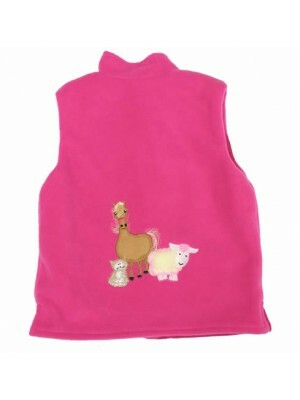 Fabric C..
A reversible bodywarmer with cerise fleece and a unicorn applique on one side and a cerise cord on the other. Popper openings down the front and pockets on both sides. Fabric Content - Cotton Corduroy with Polyester Fleece Garment Care - Co..
A pretty girls bodywarmer with a farmyard gathering applique on one side and a soft floral needlecord on the reverse. Popper openings down the front. 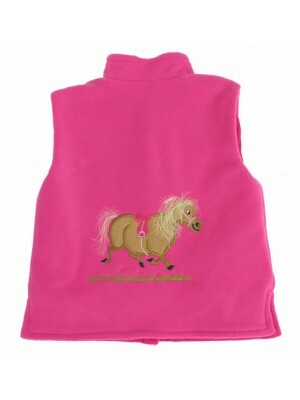 Fabric Content - Cotton Corduroy with Polyester Fleece Garment Care - Cool machine wash ..
A completely reversible bodywarmer featuring a pony/fairy applique on the back of the fleece side and a cerise cord on the reverse. Popper openings down the front. Fabric Content – Cotton Corduroy with Polyester Fleece Garm.. Welcome to Seesaw the home of reversible children's clothes. We are very proud to be celebrating over 28 years of business. We design and make our range in the heart of Kent. We love combining colours to make a cheerful, fun and practical range to suit every child. Our appliques are unique with thousands of stitches in each design making them fantastically durable and adorable. Click on categories on the bar to see the range. Seesaw was set up over 19 years ago by Lynne and Charmian and we design and manufacture all the clothes in our workshop in Ashford, Kent. We design and make all our clothes in rural Kent and wherever possible use 100% cotton fabrics. 2 looks for the price of 1. When you join us we ask for a £100 deposit. There is no other outlay! We provide you with a rail of clothes and everything you need to start selling. Once you have sold £500 of clothes within 2 months of joining Seesaw £50 of your £100 deposit is refundable (the remaining £50 deposit is returned to you once your agency with Seesaw is over). Basic commission is 25% but there are ways of earning extra bonuses. What do you have to do? Sell the clothes! Parties and playgroups, mothers and toddlers, NCT, local sports centres and craft markets – there are many opportunities and we are here to help. No experience needed just lots of enthusiasm. If you would like more information on selling our clothes please telephone us on 01233 611622. Or contcat us via our Contact us page. Wholesale enquiries are welcome. please telephone us on 01233 611622. Or contcat us via our Contact us page.